Triple the love! Stacking birthstone name rings are the perfect gift for a grandmother of three. 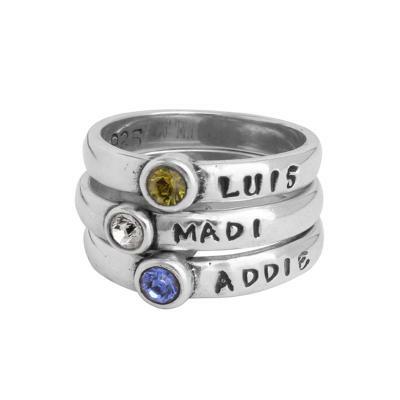 As more grandchildren arrive, more custom stackable birthstone name rings can be added! Triple the love! This set of three Stackable Grandmother's Birthstone Name Rings represents your three bundles of joy. Sizing: When determining your size, we ask that you give us a size that fits comfortably. The rings are available in whole sizes and can vary between the whole size and a quarter size up depending on how long the name is that we are stamping. If you are unsure of your size, you can purchase a ring and select ring sizer from the drop down menu. We will send you a ring sizer and instructions on how to email us your size. If you are between sizes you need to decide if you want the ring to fit a little snug or loose. We can not resize the birthstone rings because of the setting so please make sure to order the correct size. My wife loves the rings! !